Johnson's Japan Nippon, Kiusiu, Sikok, Yesso and the Japanese Kuriles. 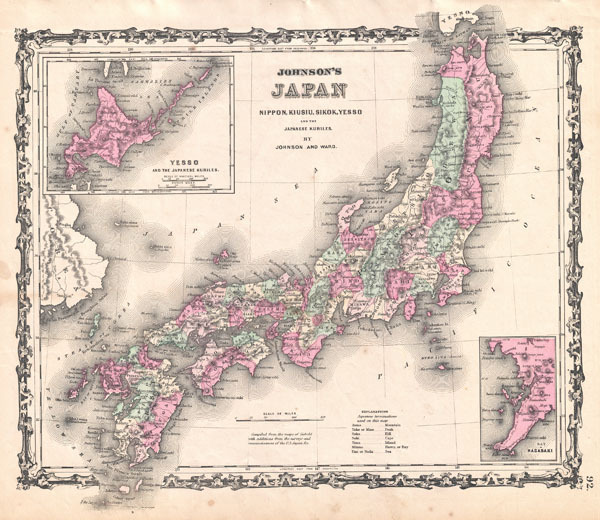 A very nice example of A. J. Johnson's 1862 map of Japan. Covers the Japanese Islands from Kiusiu north to Yesso (Hokkaido). Offers considerable detail with color cording according to province. An inset map in the upper right focuses on Hokkaido or Yesso and the Japanese Kuriles. Another inset in the lower right corner details the Bay of Nagasaki. Features the strapwork style border common to Johnson's atlas work from 1860 to 1863. Published by A. J. Johnson and Ward as plate number 92 in the 1862 edition of Johnson's New Illustrated Family Atlas. This is the first edition of the Family Atlas to bear the Johnson and Ward imprint. Very good condition. Minor discoloration on left hand side of map extending into printed area from outer border. Blank on verso.